The New York Times bestselling non-fiction collection, now in paperback, from the author of American Gods, now a STARZ Original Series. Neil Gaiman is the New York Times bestselling author of the novels Neverwhere, Stardust, American Gods, Coraline, Anansi Boys, The Graveyard Book, Good Omens (with Terry Pratchett), The Ocean at the End of the Lane, and The Truth Is a Cave in the Black Mountains; the Sandman series of graphic novels; and the story collections Smoke and Mirrors, Fragile Things, and Trigger Warning. He is the winner of numerous literary honors, including the Hugo, Bram Stoker, and World Fantasy awards, and the Newberry and Carnegie Medals. Originally from England, he now lives in the United States. He is Professor in the Arts at Bard College. 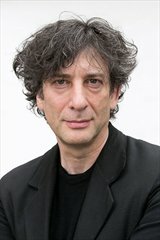 With the exception of American Gods (I’m apparently the only person on the planet who didn’t like it, but I recognize that it may have come into my life at a bad time, and I’ll eventually give it another chance) I’m a big fan of Neil Gaiman’s work, so when I was offered the opportunity to review some of his non-fiction, I went over the wall and into the ocean (metaphorically) and ended up wishing I was young enough to be a Bard student so I could take this man’s class. I was hooked on this collection from the moment I opened the book and read his preface (introduction, whatever – I don’t have the book in front of me because a friend pulled it out of my hands the second I declared “FINISHED!”), and while not every piece resonated with me the same way, I found myself entranced, intrigued, provoked, amused, moved, and amazed, sometimes alternately, sometimes all at once. I tend to read books of essays and short stories in chunks. I keep them in the bathroom, either in a basket near the toilet (oh, come on, we all read there) or on the side of the tub and pick them up whenever I’m in the appropriate place. I don’t pick and choose the order, though sometimes I’m tempted by a title. That opening piece, “Some Things I Believe,” is something I’ll re-read, likely often. The section on comic books (and comic book shops, and comic book artists’ influence on Gaiman) is something I appreciated as a casual comic book reader, but I know my husband and the friend who stole my book will love a lot. The section about film was incredibly informative, but there are also essays devoted to ghosts, music, and even one on the political/cultural situation in Syria. Reading this book felt like a conversation with an old friend, the kind that rambles from topic to topic, touching on recurring themes, offering new insights, and involves each of you making lists of Books You Must Read and Music You Must Hear. This book, The View from the Cheap Seats, is that conversation. Or at least, it’s an overture to starting it. Goes well with Earl Grey tea and raspberry crumble. 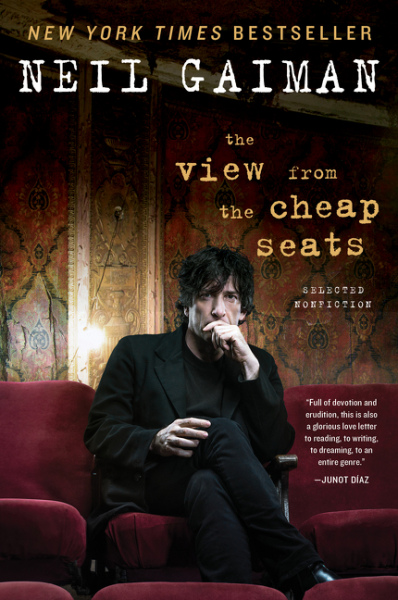 Review: The View from the Cheap Seats, by Neil Gaiman by Melissa Bartell is licensed under a Creative Commons Attribution-NonCommercial-ShareAlike 4.0 International License.